a vast Vaishnava temple complex dedicated to Vishnu as Sri Ranganatha, and a smaller Shaiva complex dedicated to Shiva as Jambukesvara. The Jambukesvara temple mostly dates from the 17th century and its 7 gopurams are fine examples of Nayaka architecture. 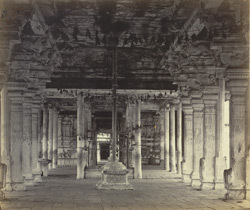 Lyon's 'Notes to Accompany a Series of Photographs Prepared to Illustrate the Ancient Architecture of Southern India', edited by James Fergusson, gives the following description of this view: 'In front of the Gateway...is a porch of considerable extent, with a broad aisle or nave leading to the sanctuary, and crossed at right angles by a similar aisle leading to the side-courts. The architecture of the temple is generally good, and the details well cut, but their sharpness has been taken off by repeated coats of white-wash, and the design disfigured by paint daubed on without taste or knowledge. The temple is thus, far from producing the effect on a visitor, which it would do, if it had been spared from this exhibition of modern vulgarity'.